The Wasatch Backcountry Skiing Map is the Android version of the popular paper map, interactive website, and iOS app. As with the other maps, the Android app includes an index to almost 1,000 backcountry locations in Utah’s Central Wasatch mountain range. 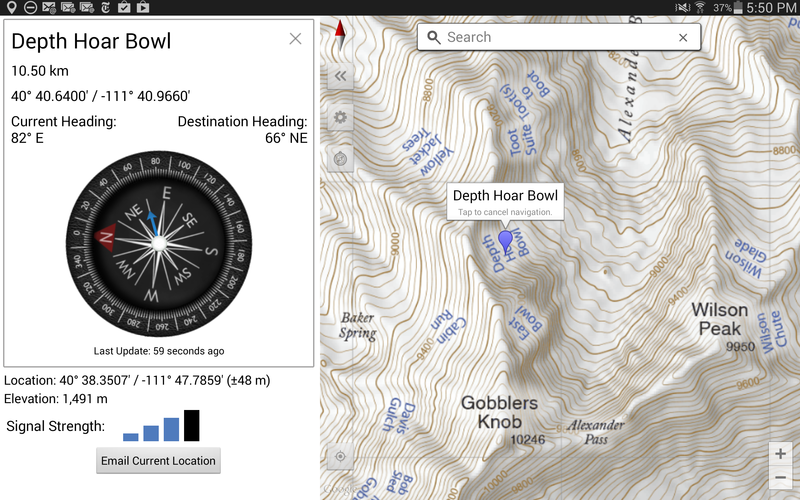 With its familiar interface, the Wasatch Backcountry Skiing Map accesses your Android device’s GPS to display your current location on a high-resolution topo map. And with only a few taps, the “destination arrow” on the integrated compass will point to your desired backcountry ski location. Watch this three-minute video to learn more about the Android app. Hundreds of the named locations in the Wasatch Backcountry Skiing app now link directly to the Wasatch Backcountry Skiing Guide. IMPORTANT: The backcountry locations in Wasatch Backcountry Skiing Map are only approximations. When navigating, the “destination arrow” points directly to the destination without regard to hazards such as avalanche paths, cornices, cliffs, and rock fall. It is your responsibility to travel in the backcountry safely. This app is available exclusively through the Google Play Store.